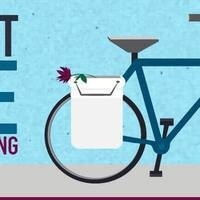 A DIY clinic focused in the art of making sturdy, sustainable, waterproof panniers out of plastic buckets! Bring your own bike rack for the perfect fit. *Outdoor Program Membership Required: Students are already members! You can purchase a $5 day pass or an annual year-to-date membership for $25. You will also need to purchase a one-time community member card from Card Services in the Erb Memorial Union for $10. The card and membership will enable you to access the Rental Barn for affordably priced outdoor gear, the Do-It-Yourself Bike Workspace, and entry to Outdoor Program events and Common Adventure trips. Questions? Email opwww@uoregon.edu or call 541-346-4365.